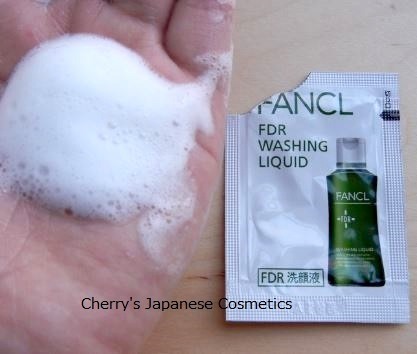 Fancl’s FDR is the line for the most sensitive skin, like atopic skin. I (Cherry) have no atopic skin, but M, the one of the girls behinds me has, and she uses only this FDR line. According to M, other products give her pain, and I know she has not tried so many other skin care items. In my case, I sometimes feel strong pain with my own sweat. I tried this FDR early spring, because it is early Summer when I feel pain by my sweat. OK, this is the Face Wash. There are no make-up removers for this line. People has such sensitive skin might do not make-up. Actually, the full bottle is not pouched like this. This is a sample. Unlike Washing Powder , This is a liquid. It is easy to make a rich foam. And it never clean up all of my face oil. That might be the good point for those who has quite sensitive skin. Of course I could clean my dirty face up. Please check the latest price, and order from here;”FDR Face Wash”.